Chelsea (Chloe Levine) agrees to take her friends to a remote cabin that belonged to her late uncle when they get in trouble with the law after her boyfriend Garth (Granit Lahu) stabs a police officer. Upon arrival Chelsea starts to have memories from when she was a child and she’s taken by surprise when they bump into The Ranger (Jeremy Holm) who used to know her. Despite warning her friends to keep a low profile, Chelsea is angered when they ignore her and as a result one of the group is shot. Locked in a race against time, Chelsea and her friends try to find their way to safety before they become victims too. 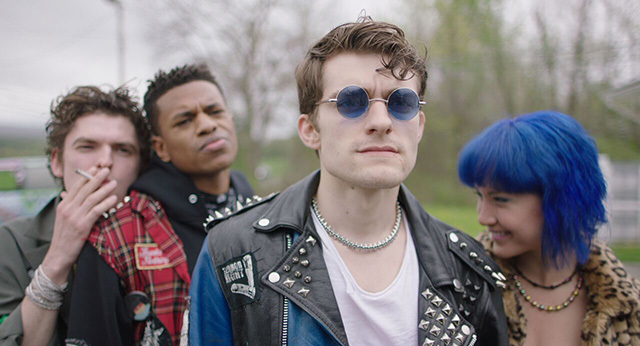 The Ranger is the feature film directorial debut of Jenn Wexler and it was the opening film of Arrow Video FrightFest 2018. When I spoke to her before the screening, Wexler promised that the film would be different from anything we’ve seen before and she’s not wrong. Backed by a punk soundtrack with a punk influence running through the visuals, The Ranger is a nod back to horror films of the 80s with a twist. The teens here aren’t young innocents, instead they take drugs, they drink and they like to party. Short flashbacks appear throughout the film, hinting as a dark secret from Chelsea’s past but the film carefully doesn’t play its full hand too early. Instead those flashbacks serve to tease and further draw you into the film. The Ranger also has a very dark comedic streak that serves up plenty of laughs, even during the death sequences. The audience reacted well, cheering and laughing at all the appropriate moments. At the heart of The Ranger is a stellar performance from rising star Chloe Levine. At the beginning of the film she appears meek and mild, a stark contrast to the rest of her friends, but as the film progresses we start to see a very different side to hear. Levine plays the role well and she’s a heroine I can most definitely get on board with. Another standout among the cast is Granit Lahu who plays Chelsea’s boyfriend Garth. He has the looks to match a young James Dean and he oozes charisma on screen, even when he’s behaving pretty badly. He has good chemistry with Levine and like his co-star, he’s someone to be keeping a close eye on. Jeremy Holm has to be mentioned to. He plays his role with a tongue firmly placed in his cheek but he knows how to bring menace alongside the comedy. In the hands of a lesser actor his character could have gone too OTT by the end but he plays it within the rules of the film and it works. I also never want to encounter him, anywhere, ever. The Ranger is a quirky and original film. Director and co-writer Wexler has a horror hit on her hands and she makes a very memorable first impression. The Ranger was the perfect choice to open this year’s festival and it’s a film that I’m sure will rank among this year’s best. With scares, plenty of blood, comedy and a unique approach to the genre, Wexler has created a fantastic movie that will easily find a welcoming and passionate audience. She’s also found two stars with plenty of promise in Levine and Lahu. THE RANGER from FrightFest on Vimeo.